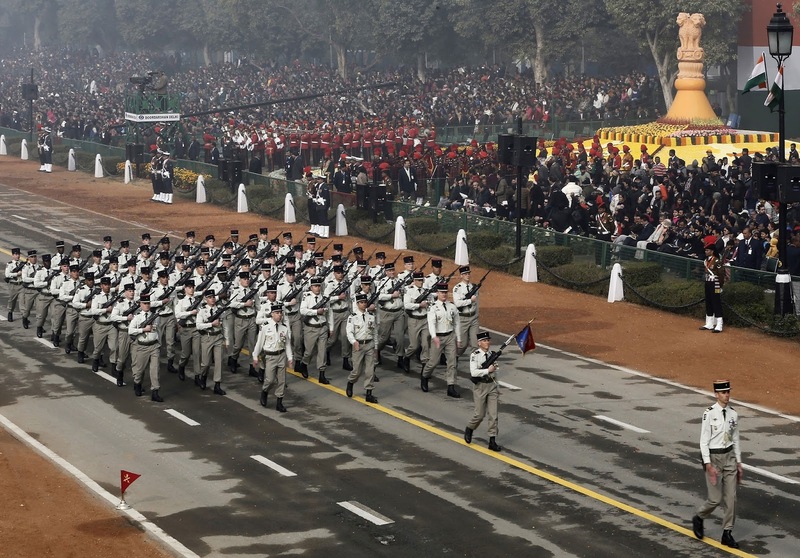 Like any other urban Indian student, Republic Day for me was like any other National Holiday. No school, Sleeping in till late and then hearing my father’s story about his time as a Sea-Cadet. The March past in New Delhi that he almost made to and how his friend lost the concessions form of the Railways and how he missed his chance to attend this prestigious moment of his life. My husband Kunal on the other hand, like any other geeky teenager sat glued to the television. 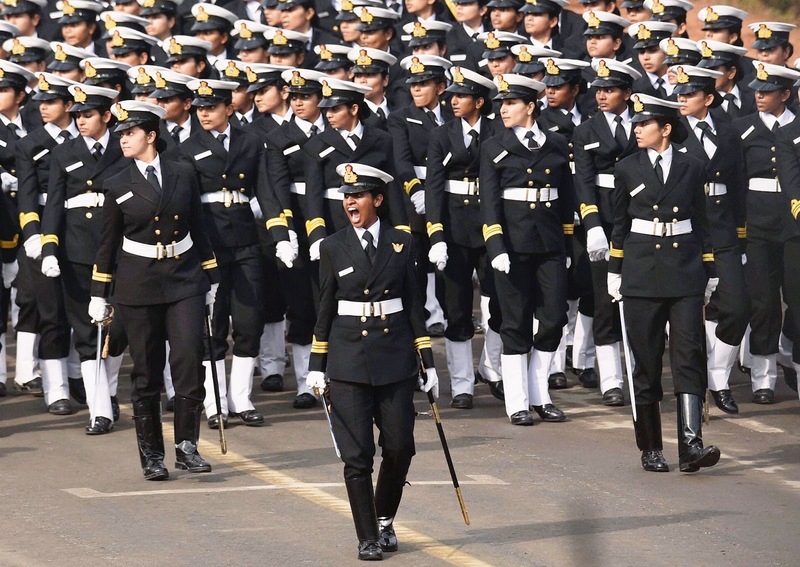 Watched the Parade live on Doordarshan and marveled on India’s military prowess. I often say this, We are destiny’s Children. The astrological powers in our kundli had our fates written. A Friend’s father Is the current Minister of Law and Justice of India, the honorable Shri D. V. Sadanand Gowda. He has handled various portfolios, including the Chief Minister of Karnataka and the Ministry of Railways. 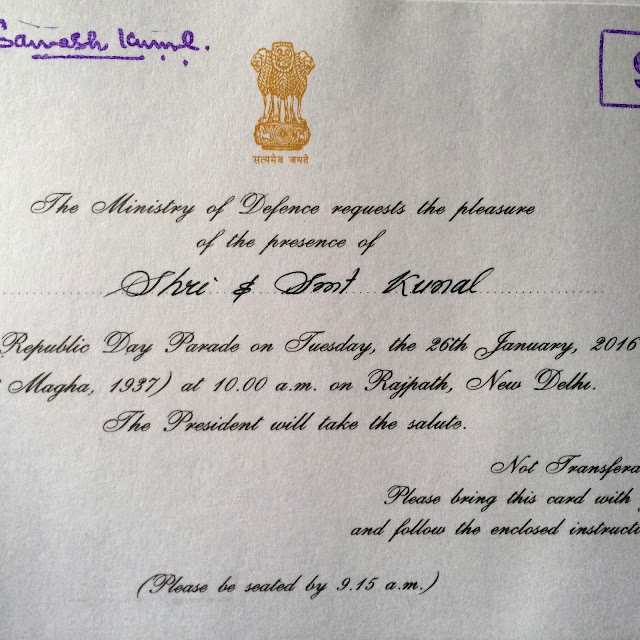 He was so kind enough to extend us an invitation to witness the 67th Republic Day Parade In New Delhi ! Oh what an absolute Honour it was. Kunal and I were elated. We sent our ID’s 2 weeks prior to the parade for our security clearance. Tickets were booked and our best suits were pressed for THE-DAY ! We reached a day PRIOR and for the first time I understood what a mission it is to live in Delhi ! The high security alerts at the airport, The multiple check-nakas to be passed before you get out into the city. The roads all marked off. The 5 km Radius near India Gate was curfewed out by mid-night. The national capital, particularly the Central and New Delhi areas, were brought under unprecedented security blanket as thousands of personnel kept a hawk-eye vigil to thwart any untoward incident. There were intelligence inputs that terror groups may target some important installations in the city. We were to meet at the ministers residence at sharp 7am. The following morning it took us a little under an hour of circling at the Tyag-Raj Marg to understand that we will not be able to enter the area – let alone the minister’s residence without the required pass. A massive ground-to-air security apparatus was put in place in the national capital. Commandos with light machine guns were deployed at 10 strategic locations and anti-aircraft guns remained positioned at vantage points in the capital. 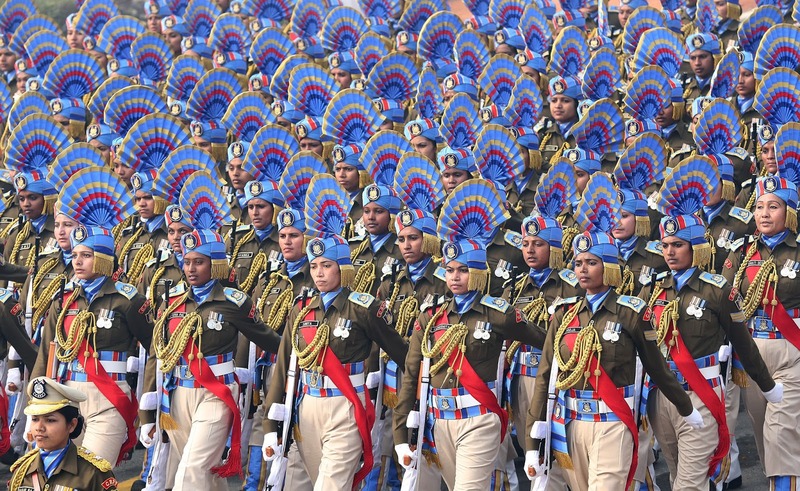 The entire region of Central and New Delhi had nearly 50,000 security personnel drawn from Delhi Police and central security forces guarding every nook and corner. Under this situation we stood in 7 degree temperature on a big round about and made a few calls. Mr. Shetty, our Minister’s P.A. was kind enough to come on a long morning walk in his best suit to come give us our pass and allow us to enter the road leading to his residence. We were greeted so warmly by this humble man. Mr Gowda reminisced about his days with the BJP party and his trials and tribulations to get to where he is today over tea and snacks. The day took on its course then..IT started with a flag hoisting ceremony at his residence after which I took my first ride in a LAL-BATTI walli car. I was absolutely elated ! It was the first time I understood that POWER is different from MONEY. We were a part of the 4 car convoy on our way to the saluting gallery. We went through the necessary security protocol and were shown to our seats. We were a party of a thousand people who were there to watch the nation’s pride. Slogans of Bharat Mata Ki Jai … Vande Mantram made the crowds swell with pride. French President Francois Hollande was among the guests of Indian Prime Minister Narendra Modi invited to view the spectacle of the parade held in New Delhi, filled with marching bands, floats, camels, military hardware, and stunt performers. French soldiers also took part in the parade. It is thought to be the first time a foreign army contingent has participated in India's celebrations. 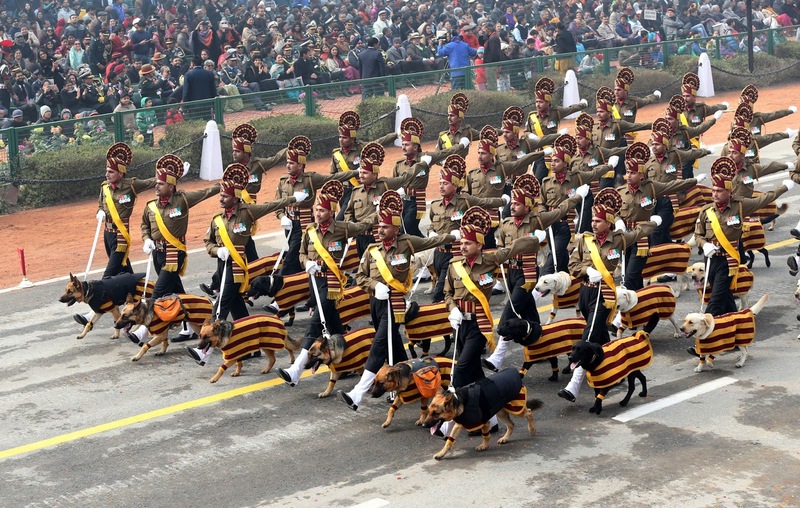 Colourful floats from various Indian states, traditional dances, and gymnastics by children were also part of the event.A Dog squad of India’s paramilitary units also participated for the very first time ! 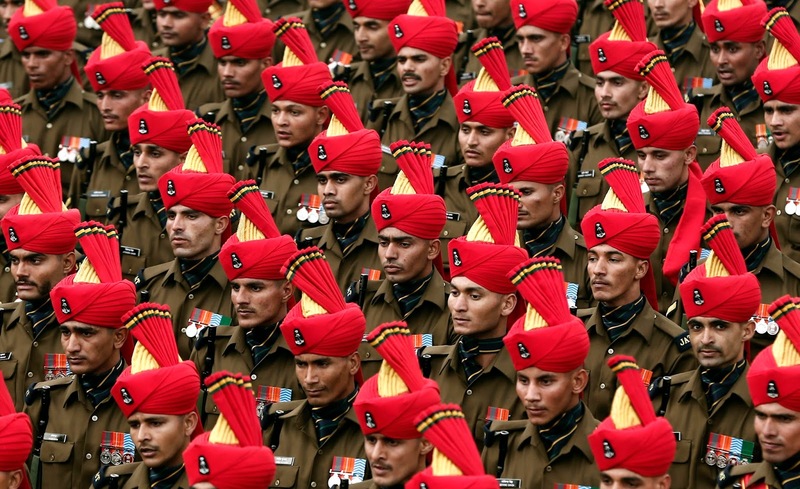 A total of 23 tableaux were on display at the ceremonial parade with 17 of them belonging to various states and Union Territories. The tableau of Gujarat depicted rare and exotic varieties along with the Sidi community settled in the Gir forest, performing their traditional dance. The heart throb of the event was the Indian Aviation’s gallant display. 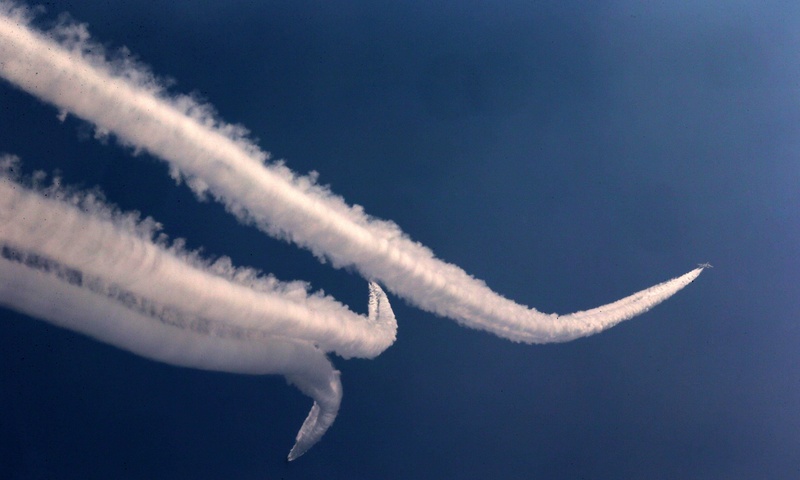 A breath-taking ‘Trishul’ formation comprising three Su-30 MKI of No. 24 Squadron flew over the Rajpath. Trailing them was the ‘Globe formation’ comprising one C-17 Globemaster flanked by two Su-30s, followed by the fighters, where five Jaguars flew in Arrowhead formation, another five MiG-29 Air Superiority Fighters called the ‘Tridents’ flew in Fulcrum style. The end of the parade was marked by a single Su-30MKI fighter pulling up vertically in front of the reviewing stand while carrying out so-called vertical Charlie rolls. I can still close my eyes and experience its vibrations in my heart. Like all good things, the Republic Day Parade was all but 90 minutes. The sun came out a few times but the clouds kept us chilled but enough for us to enjoy the spectacle. The Afternoon ended with a hearty Indian Meal and a promise to play catch up of the parade every year even if we do not get these life changing experiences. The Invite to the event now is kept in a straight format with all the other important household papers and is something I am going to cherish for a long time !! Koh Samui never aged !